1. Swipe in from the right edge of the screen, and tap or click Settings. 2. Tap or click Change PC settings, tap or click PC and devices, and then tap or click Bluetooth. 3. Make sure that Bluetooth is on. 4. Hold down the top button on the Surface Pen for seven seconds, until the light in the middle of the pen clip starts to flash. 5. When the pen appears in the list of Bluetooth devices, tap or click it, and tap or click Pair. That’s it! You should now be able to use the Surface Pen with your Surface 3. You can quickly confirm the connection by pressing the top button on the Surface Pen. This should automatically open OneNote. 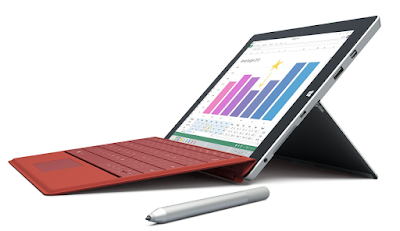 The Surface Pen is sold separately from the Surface 3 while it is already included with the Surface Pro 3. Microsoft has released it in new colors, so you can grab it red, dark blue, or black, instead of the original silver one.